Ollie was 'reading' one of his science books in the car the other day and wanted to do 'an experiment with volcanoes'. It sounded like a great idea to me, so when we got home from swimming I decided that making a bicarbonate volcano would be a fun activity. 1-2 teaspoons colouring - we used blue because ours is a bit rubbish at being blue but makes a good rocky grey colour. 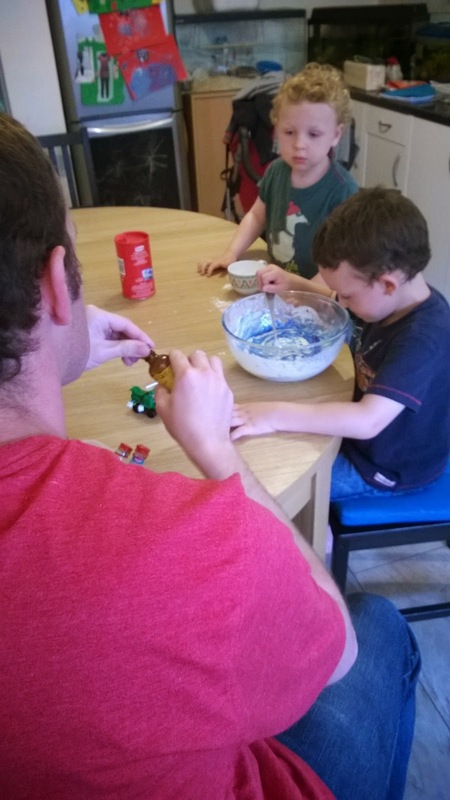 Help your kids to measure, add and stir the ingredients, then put into a saucepan and cook on a medium heat stirring constantly until the mixture thickens and looks like dough. it will obviously be hot at this point, so when we make play dough I add in another activity while we wait for it to cool. For our 'cooling' activity on this day Matt and Ollie made a volcano picture. Matt drew the cone, magma chamber and vents, then Ollie coloured it. 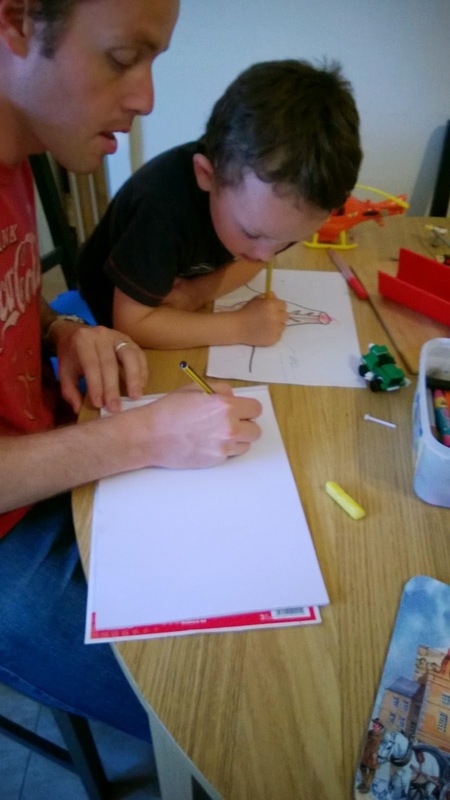 Matt drew guide lines for Ollie's words and they worked out what to write letter by letter "What is this red stuff you've drawn inside the volcano? That's right it's magma. What do you think the word 'magma' starts with..." with some help over shaping the letters by writing each out on a separate piece of paper (while Ollie tuts "I know how to write a 'm'!"). I was surprised when Ollie said that the stuff coming out of the volcano was lava and chunks of rock blown off the top - I didn't realise he had remembered that the molten rock is magma when it's inside the volcano and lava when it's outside - I've had A-level students that didn't remember the difference. In the end they labelled the vent, cone, lava and the magma chamber, by which time Toby had made a birthday card for his friend and our play dough was cool enough for the next stage. I save plastic pots and tubs for our experiments and activities, and today a pot which had previously contained a small fairy cake in an Asda children's lunch pack was the perfect one - small, plastic and with a push fit lid into which I could easily cut a small round hole in the centre. I added a couple of teaspoons of red food colouring to the pot, then four teaspoons of bicarbonate of soda and put the lid on. This formed our magma chamber and the boys modelled the volcano around it. Next I filled a large medicine syringe with vinegar and the boys took turns squirting it into the magma chamber and laughing at the explosive results. The first couple of goes where a bit too tame, just gently bubbling down the volcanoes sides, so Matt added some sticky tape to make the aperture in the lid of the chamber smaller. The resulting fountains of bicarb and vinegar caused great delight. This video isn't the biggest eruption we had, but for some reason the other footage isn't working. So what are the science bits from this? The bicarb and vinegar experiment is an old favourite - adding the acid vinegar to the alkaline* bicarbonate of soda causes the release of carbon dioxide bubbles. If you add pressure by having a lid on the container with a hole in it, the results can fountain up quite impressively - for a really impressive version look online for videos of the 'mentos and cola' experiment. What has this got to do with volcanoes? 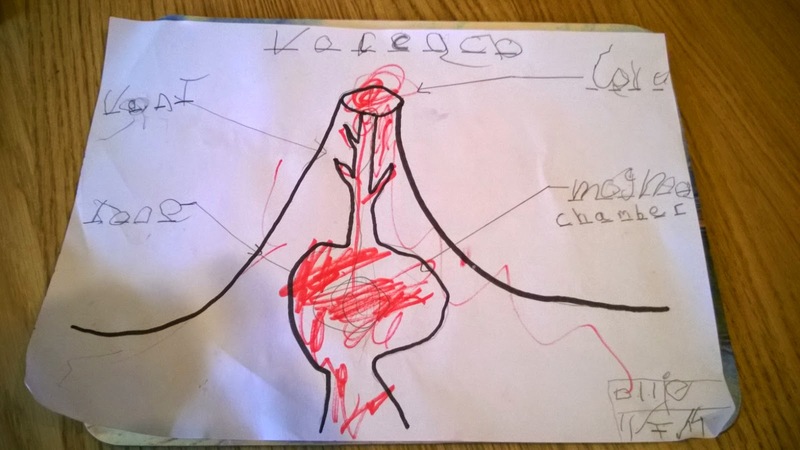 Quite a bit surprisingly, since there are different types of volcanoes but the one that every kid draws, the cone shape, is an explosive volcano**. Famous examples of this type include Mount St Helens and Mount Pinatubo. These volcanoes are explosive because of the presence of gasses dissolved under pressure in hot, highly viscous (thick) magma. When sufficient pressure builds up to blow a hole in the top (or sometimes side if the vent to the summit is plugged) of the volcano, the pressure is released and the gases suddenly come out of a dissolved state into a gaseous state which froths up the newly emerging lava to form volcanic ash, which, along with other pyroclastic material, rockets up into the atmosphere until it runs out of energy and then collapses on itself, at which point it rushes down the sides of the volcano as a pyroclastic flow, a very fast deadly wave of burning hot poisonous gases and ash. Very few people actually die from lava flowing from a volcano - it's the pyroclastic flow which is the real danger. 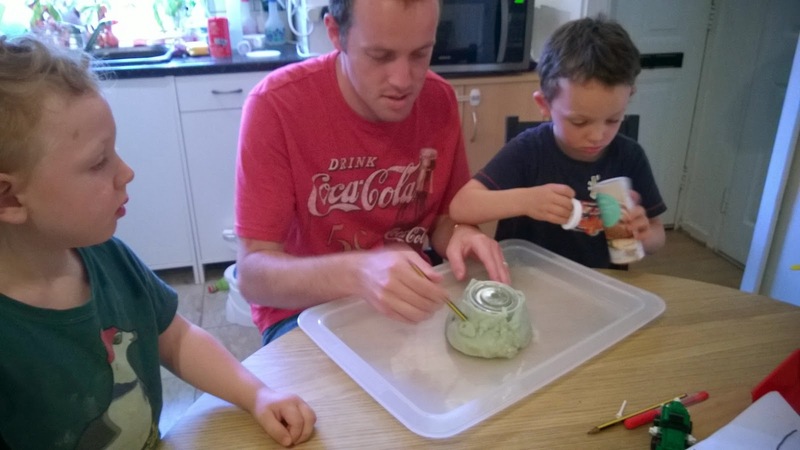 The bubbles you create by adding vinegar to bicarb are about the safest way you can demonstrate how important gases are in an explosive eruption. As always, don't be afraid to use the proper terminology if you know it when explaining and describing what's happening as kids are amazingly receptive and will surprise you with what they retain over time. If you don't feel confident explaining what's happening, do the activity anyway and then have fun together looking up explanations in books or the internet. Finding videos of real volcanoes is a good follow up activity, and if you have some don't forget to try floating your pumice stone foot rubber in a bowl of water - rock shouldn't float right? Pumice is special and it's all down to those gasses that were in the magma. Safety bit: Things to be careful of - usual care to be taken with hot stove/hot play dough while you're making the dough; during the chemistry bit be careful of getting bicarb/ vinegar in eyes - wear eye protection if you are concerned, wash eyes immediately with luke warm water if you do get any in there as both will sting. It can be fun to see how high you can make the volcano jet out, but you don't want to be showering bystanders with the discharge so do exercise sense and start small. *ok chemistry purists, technically it's a base because it's dry, but acid and alkali are everyday terminology. ** the other main type is an effusive volcano - one that oozes over a long period of time, such as those on Hawaii. Once upon a time there were also vast lava flows called 'flood basalts' but we can all be glad we haven't any of these now - look up 'Deccan traps' if you want to know why. Other less impressive but still interesting types of volcanoes are less well known, including mud volcanoes.